Year 2017 has begun with a more positive and a year of hope for the gem and jewellery industry of India especially after a trying 2016. Trying because of global slowdown influenced by crash in oil prices coupled with terrorism and certain economies facing the brink of bankruptcy in Europe. Far eastern countries like China, Malaysia, Japan have been holding the flag high only to whither off with time. It is only India that has been continuously beating inflation and juggling policies and taxation in the trying times, all thank to the exceptionally perseverant countrymen who with patience and will power even thwarted off the worst times during demonetisation. While demonetisation was an important policy decision by the current government, it did a great harm to the gems and jewellery sector in the country taking the industry back a few years. The loss suffered during the last few months was truly agonising. Technology & Machine tool sector has an important role to play in this critical period that the jewellery industry is in. Introduction of Time and cost saving technology tools is the key that would help the industry bounce back. Introduction of such tools will not only help jewellery manufacturers to save labour cost but also support them in churning out more products in less time and also it is a known fact that technology helps in minimising wastage which is a critical factor in times like these that is more competitive and price sensitive. Indian manufacturing companies such as Sahjanand, Gurukrupa, Kaizer , Goldside production, Aditi Lazor, Solanki Machine Works and many other Indian distributors of multinational products who are launching state of the art machine tools for the industry are definitive of making a difference in the jewellery sector and help build business and profits. 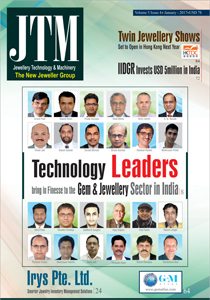 The current issue of JTM carries a special report on Leaders from the Technology & Machine Tool sector which will be distributed through our two booths during the IGJME & Signature show. JTM bureau has worked through a research and personal interactions to come out with those companies in the Tech sector who will make a difference through their productions and product launches. The company’s projected have been in the business of servicing the Jewellery sector in India through decades and very well understand the complexities and profit volatilities existent in the economy. JTM Bureau thanks AFEMO – Italy to have supported this special report and do hope this report will be a thoughtful reference guide for Tech companies and manufacturers alike.